The Kids In Need Foundation is a national 501(c)(3) charitable organization founded in 1995. The Foundation’s mission is to prepare children to learn and succeed by providing free school supplies to students most in need. Its National Network of Resource Centers includes 32 facilities where teachers from low-income schools go to obtain free school supplies for their students. School supply giveaways in communities not served by Resource Centers are accommodated through the School Ready Supplies program, and students who have gone through natural disasters are helped to get back to their normal routines with new backpacks and supplies through the Second Responder® program. In addition, two Teacher Grant programs award preK-12 educators with funding to provide innovative learning experiences for students. 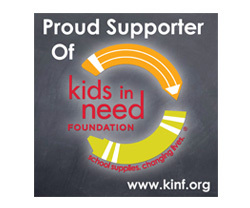 The Kids In Need Foundation has distributed more than $550 million in school supplies since its founding, directly benefiting 3.6 million students and more than 120,000 teachers annually, and has awarded $1.5 million in grants to teachers.